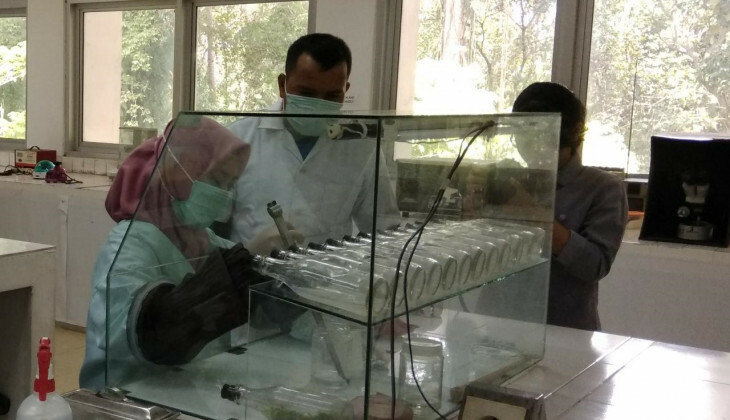 A team from Faculty of Biology UGM has trained a farmer group related to in vitro cultivation of orchids. This is a community service project between Bank Indonesia Yogyakarta and the team under the coordination of Dr. Endang Semiarti, M.S., M.Sc. The team socialised technical aspects and demonstration plot as well as in vitro cultivation of orchids in October 2018 to the Taruna Tani Kampung Flory Sleman group. “The programme was designed to equip farmers for the preparations of orchid cultivation in Kampung Flory,” said Endang. A number of speakers were invited to describe aspects of orchid cultivation, including Ir. Kadarso, M.P., on orchid agribusiness and potential of hydroponics orchid in urban areas, and Dr. Endang Semiarti, M.S., M.Sc. on orchid vegetative and generative multiplication. Another speaker, Hj. Sri Suprihati Lestari, owner of Titi Orchid, explained about orchid care. She later handed over some orchids to the participants to be grown in the greenhouse of Kampung Flory. Endang Semiarti said to achieve Kampung Flory as Sleman regency’s orchid centre, the farmers should know in vitro cultivation starting from cross-breeding to asepsis multiplication in culture bottles. “This is necessary to do bearing in mind that orchid seeds are miniscule, even microscopic, while not having food supplies, so to grow orchids the seeds should be grown in an artificial medium in a bottle and in a sterile or asepsis condition in the lab,” she explained. The farmers were also introduced to the facilities of the lab for orchid cultures at the Biotechnology Lab of Faculty of Biology UGM which is one of the pioneers of orchid cultivation in Indonesia. The participants were given a chance to practise in vitro cultivation. Chairman of the group, Surono, welcomed the programme. He said going forward they would try to develop a laboratory model that is adjusted to the resources of Kampung Flory. Meanwhile, Mahmudi, representative from Bank Indonesia Yogyakarta, said Kampung Flory was expected to be an institutional model that can run its own orchid cultivation and develop the concept of plasma and core as well as e-commerce.